The main purpose of creating recurring tasks is to periodically remind us of our obligations within the preset days and times. In GTD® it is called "areas of responsibility". This may concern both professional activities (like tax payment, personnel training, etc.) and personal chores (like house cleaning, checking child’s homework, going to the gym etc.). With a flexible setting of recurring tasks in MLO you can fully automate the display of these actions in your To-Do list. The recurrence options are identical in MLO on all supported platforms. Some advanced options are not available in the mobile versions, but you can configure them in the desktop version and then synchronize the data. Below we'll walk you through examples from the desktop version. To set up a recurrence open Properties in the Edit mode -> Timing & Reminder section -> Recurrence. There are Main and Advanced options for repeating tasks in MLO. Main settings are mandatory, the task recurrence will not work properly without them. They determine the frequency and order of task recurrence. For each recurring task you can select or build your own recurrence pattern as a construction set. There is no need to limit oneself to standard repetitions daily, weekly, monthly and yearly. last Sunday of December of each year, which is especially important for the strategic planning of the coming year. Example: You have to take vitamins for 14 days. Set recurrence for daily and specify 14 days. The task will be reminded of every day until you complete the task the specified number of times. Example: Suppose you have bought an annual subscription to the gym. You create a recurring task, for example, on Monday-Wednesday-Friday. And for the same task, you can specify that this mode is maintained until the date this subscription expires. Unless, of course, you are going to renew it regularly. Advanced options are more fine-tuning options. 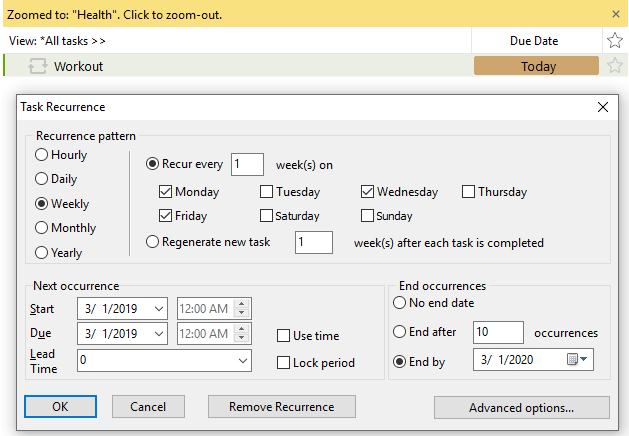 If you are an experienced user of the MyLifeOrganized task manager and the suggested recurrence options are insufficient for you, there are additional options used to substantially extend the functionality of cyclic tasks. In MyLifeOrganized recurring tasks can have their own subtasks, which can be repeated or not repeated together with the main task. If a recurring task has subtasks, you can set how the system should deal with completed subtasks. In particular, when to display them next time. 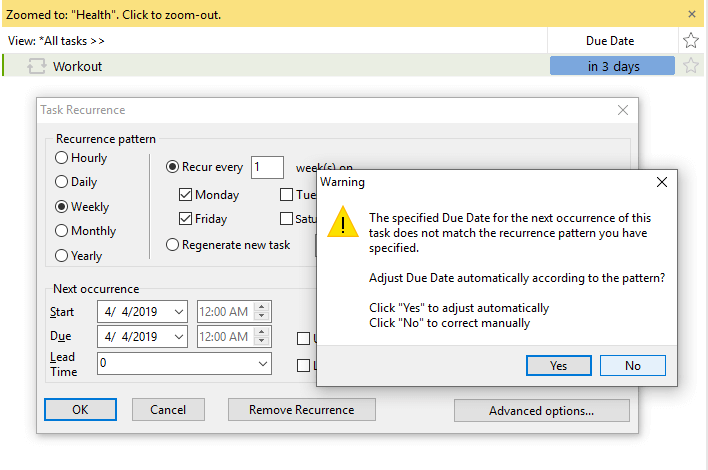 Disable automatic reset: all completed subtasks of a recurring task when transferred to the next repetition remain completed. Example: There is a recurring task "Meeting". The issues on the agenda that need to be addressed or discussed have been added as subtasks. All the solved issues (subtasks) remain in the system as completed and will not be displayed during the next display. Reset all subtasks to uncompleted: at the next recurrence all completed subtasks become active again. Example: There is a repeating task "Pay utility bills" with subtasks: pay for gas, pay for electricity and so on. After the completion of the "Pay utility bills" task itself, all types of payments become active again. Reset all subtasks to uncompleted, if all subtasks are completed. For which purpose can this be applied? For the most flexible approach to periodic tasks. Example: There is a recurring task "Gym workout". As subtasks you add the workout sets for different muscle groups: chest + shoulders, back + biceps, chest + triceps, legs. You should set "Reset all subtasks to uncompleted, if all subtasks are completed" and "Do not create a completed copy of this task on recurring" (to be described in the next chapter). A similar approach can be applied to writing blog articles, family rest on the weekend, doing housework any other activities. In MyLifeOrganized, recurrence can work not only after you complete a recurring task, but also after you complete its subtasks. Disable automatic recurrence (set by default). It does not matter which subtasks are marked as completed. Recurrence will work only after the main task on which the recurrence is set as completed. Automatically recur when any subtask is completed. It’s convenient when choosing among a variety of options. When you complete any subtask, the parent task is considered completed and recurs. Automatically recur when all subtasks are complete. It is effective to use if the recurring task itself is generalizing and serves only to unify the tasks of the same type. Example: You may have a task "All taxes paid! ", where the subtasks are a list of all taxes due for payment. When everything’s paid automatic recur will work, without the need to complete the main task. - to quickly create a copy of the task, but without recurrence. You are not limited to use only a specific automatization option. From the options described above you can create any combination you need for each specific case. - automatic recurring on completion of any subtask. When the time comes to conduct classes, choose any topic that is most relevant at the moment. At the completion of the subtask, the recurrence will work. But the next time the task is displayed, all the topics will be shown, except for that already studied. - the tasks that you will not complete this time do not clutter up lists of active actions. 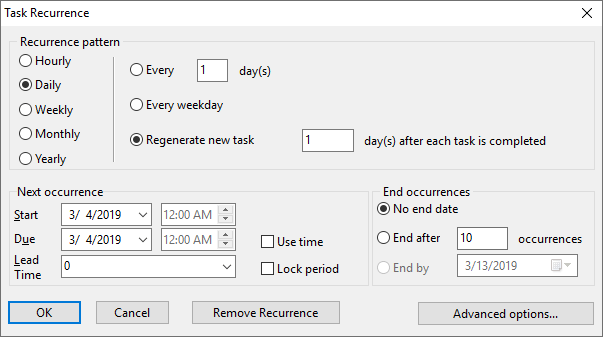 After the task has become recurring, all changes to the settings must be made in the Task recurrence window. This is necessary not to break the cycle established earlier. To open the window, click the recurrence description line in Properties. Or, just click the Due Date in the task pane. The recurrence with the "Regenerate new task..." on will occur exactly within the specified period after the task is completed. Please note that in the “Hourly” pattern the only option we can set is "Regenerate next task x hours after each task is completed".